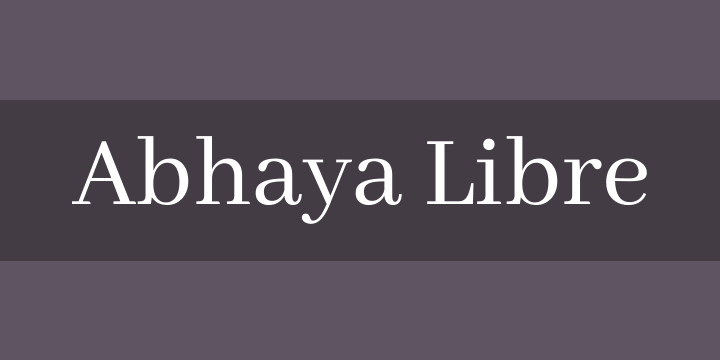 Copyright (c) 2013-2016 Abhaya Libre Project Authors (https://github.com/mooniak/abhaya-libre-font). Abhaya Libre (අභය ලිබ්රේ අකුරු මුහුණත) is the Unicode compliant and complete libre version of Pushpananda Ekanayakes’s FM Abhaya font, the most popular Sinhala typeface on Earth, with a new and original Latin designed by Sol Matas. ‘FM Abhaya’ was designed in 1996 and is the most widely used Sinhala typeface. It is an interpretation of the earliest Sinhala letterpress typefaces. The name ‘Abhaya’ comes after the King Abhaya (474 BCE to 454 BCE) who ruled Sri Lanka in the ancient kingdom of Upatissa Nuwara. The new and original Latin design is by Sol Matas and was made to match Abhaya Libre’s Sinhala. Thoroughly inspired by the style of the Sinhala, the inherent differences in stroke contrast (the thick and thin parts of letterforms) was modified to tally with the visualization logics of Latin typefaces. The ductus inherits the Didone type and is accompanies by some Sinhala forms for certain terminals. The heights of the uppercase and lowercase letters and their position on the baseline are all carefully considered to best match the Sinhala. Equal care was taken to design the widths of Latin characters to get a nice balance between both writing systems. The large counters and generous x-height, with small ascenders and descenders, create an excellent and highly legible reading experience on small screens. Thanks to Pushpanada Ekanayake for leading the design of the Sinhala and creating the original FM Abhaya; Sol Matas for leading the design of the Latin; and Pathum Egodawatta and Ayantha Randika for contributing with consulting, managing and OpenType engineering. Special thanks to Sumantri Samarawickrama and Liang Hai for consultancy, and to all the testers during development on Twitter.